When we pass a certain landmark birthday, the realisation you’re getting older time is flying by you. Been in my 40’s does have its advantages, born in 1970’s, a kid in the 1980’s. An era when of some of the greatest ever comics were born, like 2000AD. 1977 may have been ‘anarchy in the UK’ but it was ‘anarchy on our comic book pages’ when the galaxy’s greatest ever comic was born and Paul Goodwin‘s Future Shock! The Story Of 2000 AD documents the rise and fall and rise of the iconic British comic. First published in 1977, punk music was running wild, Margaret Thatcher’s government was killing off the nation’s industries, mass employment, racial tensions were high. The British comics industry was full of silly named comics that were dying Pat Mills was one of the masterminds behind 2000AD a comic book that was a counter culture reaction. He became the comic’s first editor of that weekly book that gave readers something other books couldn’t. A comic book that was refreshingly dark, funny, violent, anti-authoritarian most of all distinctly British. Future Shock! The Story of 2000 AD offers a richly rewarding and comprehensive look at 2000AD‘s history. The comic that brought us (and still does) some of the most iconic characters like Strontium Dog, Rogue Trooper and the ‘Judge, Jury and Executioner’ Judge Dredd. The documentary takes a look at the highs and lows of the comic’s unique 40 years old history going back to the early fun rebellious days but also its worst days when it tried to be a ‘Lads Mag’. Remembering the passion, the fights and the talented bunch of artists, writers that shaped 2000AD what it is today. I’m 42 two years older than 2000AD which gave me some of my fondest memories of the 1980’s as a child. At the time I wasn’t aware the comic was like a voice for the working class, attacking Thatcher’s government, I knew I was reading something truly special. The memories of the newsprint and the ink rubbing onto your fingers as you read every page, that changed eventually. It made my Saturday’s even special off to the local Newsagents spending my pocket money on Roy Of The Rovers for my Football fix and 2000AD latest issues. I wonder if my parents knew the content would I still be talking about it with great nostalgia today? There are very few British comic books that can say had such a major impact or popularity like 2000AD? When you picked up the lasted issue, it made you want to read every page, open your eyes to the establishment. The comic had such big political and Social undertones that reflected the era, ironically even resonates Theresa May’s ‘Coalition of Turnarounds and Chaos’. You could say 2000AD was the ‘Anti-Superhero’ comic book that DC and Marvel laid the cornerstone for. Ironically those two big guns of the industry would ‘steal’ the best talent like Grant Morrison, John Wagner, Mark Millar, Neil Gaiman, Alan Moore the platform to become the biggest names in the industry. This Documentary held nothing back, no stone was left unturned, the truth was let loose no matter how ugly or damaging it was to those involved. You never pissed off Pat Mills and he certainly shares his opinions with great passion, uncouth. Even the truly awful Sly Stallone Dredd movie doesn’t escape, in the words of Colin MacNeill one time artist for the comic sums that movie up in one word it was ‘shite’!Thankfully Karl Urban‘s Dredd 2012 underrated flick helps to ease the pain, bringing respect back to John Wagner. No matter what you think of 2000AD, sci-fi, fantasy and horror have a lot to thanks for what was published in its pages. It was a game changer leaving a massive Mega City style stamp on Pop Culture.Future Shock! The Story of 2000 AD is a fascinating documentary not just for fans of the iconic publication but anyone who loves a British institution that gives the establishment the two fingers. This movie was originally premiered at 2015 Horror Channel Frightfest then released on the missed UK distro Metrodome (thanks to Phil Wheat for a review!). Packaged in a 2 disc Blu-ray box with a reversible sleeve featuring original and newly commissioned artwork by Jock with the usual booklet of info. With an animated menu which shows off many of the 2000 AD characters. As usual Arrow Video deliver the fantastic selection of extra, many updated from the original Metrodome release, many are new for this release. A number of the interviews are fully extended: Pat Mills (84mins), Grant Morrison (33mins), Neil Gaiman (17mins), Dave Gibbons (47mins), Karen Berger (33mins). There’s also a brand new one with former editor Steve MacManus (25 mins). There’s a number of Featurettes Cheap Entertainment – The Appeal of comics, Judge Dredd, Dredd 2012 – True in Spirit and 15 minute one called 2000AD Vs the USA. There is ‘Strip Featurettes’ that cover Bad Company, Tharg’s comments strontium Dog, Rogue Trooper and Slaine. 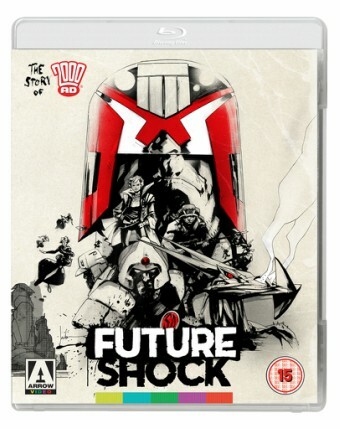 Blooper reels, how to draw Dredd & Nemesis, trailer, music, Pat Mills goes to reach towers make up the rest of the extras package. One of the best-packaged movies in a long time with over 2 hours of extras which are sometimes a rarity in the UK. The 1080p, 1.78:1 AVC-encoded transfer, everything looking crisp and in high detail. Not much was needed fixing due to the movie only been 3 years old.It may look a light brighter than usual but it doesn’t spoil the enjoyment. The audio presented as an LPCM 2.0 track, everything is clear nothing feels muffled. The documentary has a thrash metal score surprisingly not Anthrax who wrote ‘I Am The Law’ homage to Judge Dredd.